Learning how to make almond butter is easy. Choosing high quality ingredients and exercising patience are the keys to making healthy almond butter at home. Almond butter is a creamy blend of nuts and oil or super-blended nuts. Like peanut butter, you can spread almond butter on toast, crackers, or apple slices for a satisfying snack. Almond butter may be purchased at major grocery stores and health food stores premade, but it's expensive. A comparable jar of peanut butter costs less than half of a jar of almond butter. Making it at home saves money and will only take about 15 minutes. Many people prefer the richness and depth of taste that pre-roasting the almonds gives their homemade almond butter. Roasted almond butter takes only a few minutes longer to make than raw almond butter. Line a cookie sheet or baking tray with parchment paper, or use a nonstick tray. Spread out a thin layer of almonds on the tray. Roast the almonds for several minutes. Stir the almonds every minute to prevent burning. Do not leave the kitchen when roasting almonds--they can quickly go from brown to burned, and you can't use them if they're burned. 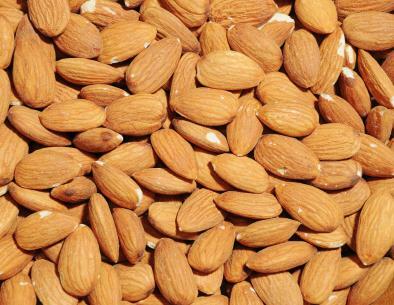 Once the almonds are roasted to your taste, remove and allow them to cool before processing. Once you've roasted the almonds, you're ready to make almond nut butter. Pour the almonds into a food processor. Process on whatever speed your machine's instructions say to use for nuts. Stop the food processor periodically and scrape down the sides. At first, you're going to get lots of chopped nuts and dust; that's normal. Continue processing, stopping, scraping, and processing again. Gradually the particles and almond dust form clumps, which will eventually turn creamy. A little olive oil can be added to speed the transition from nut particles to butter.When your nut butter reaches the desired consistency, pour it into a bowl with a tight-fitting lid or a Mason jar. Store in the refrigerator, and enjoy. Raw, living-food vegans prefer the enzyme-rich raw nut butters to roasted nut butters. To make raw almond nut butter, simply omit the roasting directions above and pour the almonds directly into the food processor. Many people enjoy experimenting with different flavors when learning how to make almond nut butter. Some people enjoy the zip of orange extract or vanilla extract in their nut butters. Extracts can add more flavor and transform your homemade nut butter into a gourmet treat. The following resources provide additional instructions, some with recipe photos and variations. Living and Raw Foods provides a raw nut butter recipe. Homemade Nut Butter includes photos of each step in the process. Backwoods Home Magazine also provides detailed instructions for making your own nut butters. Many people love peanut butter but are unfamiliar with other nut butters. That's a shame, since nuts of all types may confer numerous health benefits. Studies on vegetarian groups such as the Seventh Day Adventists, a religious group that practices vegetarianism, and long-term studies such as the Nurses' Health Study indicate that a variety of nuts in the diet may lower serum cholesterol, particularly LDL cholesterol, and provide antioxidants and fiber. Commercial peanut butter may be high in fat and added sugar such as high fructose corn syrup, so learning how to make almond butter and other nut butters at home is a smart move, particularly for the health-conscious vegetarian, vegan, and raw-food vegan.